Customers access the bakery through the Community Store, or the entrance at the harbor side of the building. Owner and chief baker Lauren Strohl said that the move is a positive one for the bakery and for the community. “Because of the increased space we’ll be able to have more employees and produce more” said Lauren. Along with the new location, there will be changes but customers can rely on the bakery for all of their favorites such as sourdough bread, waffles, biscuits, and scones, as well as fresh squeezed orange juice and coffee from Carrboro Roasters. Graceful baker Lauren Strohl, who is expecting her first baby in July. She and her staff plan to offer more baked goods such as dessert bars, pies by the slice, and sandwiches. Operating hours increased slightly, until about mid-afternoon, but any baked goods not sold by closing will be available at the Community Store. 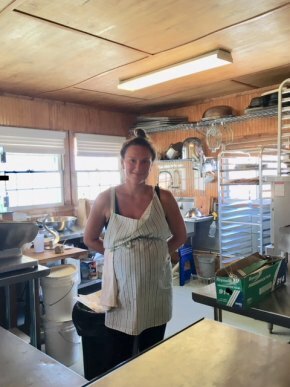 When asked how she came to run a bakery, Lauren said that though she has always worked with children in some capacity, in childcare centers and (still) for the after-school program at Ocracoke School, but she has always loved baking. She still remembers the thrill of baking her first tray of brownies at age eight. She loves to learn and has taken baking worships as well as working at a bakery while living in Homer, AK. In addition to the bakery, Lauren also runs the Community Store with her husband Joseph Ramunni, but she still finds time to give back to the community. She worked with the Ocracoke School students for three years as part of the Arts Partnership for Ocracoke Alive. The students had a great time learning to make baked goods such as sourdough bread, apple pie, and fig cake. The bakery will continue to operate as take-out only but Lauren says that customers can enjoy the nice breeze and outside Community Square seating by the harbor. There's seating on the shady porch and the sunny picnic tables. She also expressed appreciation to the Ocracoke Foundation, the non-profit that owns the Community Square, for the new wastewater system and beautiful new parking lot. 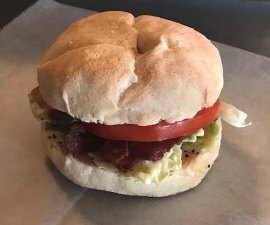 Graceful Bakery is open daily 7am–2pm. Be an early bird! Breakfast favorites can sell out fast!